Be the first to share your favorite memory, photo or story of Wilmer. This memorial page is dedicated for family, friends and future generations to celebrate the life of their loved one. Mr. Wilmer Ray Spence, age 91, of Tollesboro, Kentucky, went home to be with the Lord, Saturday afternoon, February 2, 2019, at Hospice of Hope Kenton Pointe in Maysville, Kentucky. He was born November 22, 1927, in Lewis County, Kentucky, the son of the late Jessie and Alma Walker Spence. 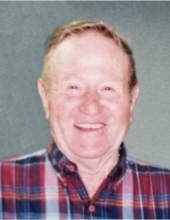 Ray was a member of the Happy Hollow Church and enjoyed pitching horse shoes, playing pool, watching basketball and baseball games and spending time with his family. In addition to his parents, he was preceded in death by his first wife, Avinell Fetters Spence; two grandchildren, Amber McCoy and Dallas Schumacher; and a daughter-in-law, Rachel Lashbrooke Spence. Ray is survived by his wife of 37 years, Nancie Strode Spence; three sons, Darrell Spence (Brenda) of Manchester, Ohio, Phil Spence (Connie) and Danny McCoy all of Tollesboro, Kentucky; one daughter, Lisa Sowers Flora (Troy) of Tilton, Kentucky; 10 grandchildren, Darrin and Megan Spence, Brian Spence, Christy Taylor, Robin Barnes, James Schumacher, Stacy Lykins, T.J. Lykins, Lacy Lykins, Breanna Flora, and Kayla Sowers; 10 great grandchildren; three great-great grandchildren; and one sister, Louise Kennard of Tollesboro, Kentucky. He also leaves many other family members and friends who will sadly miss him. Funeral services will be held at 12 noon Wednesday, February 6, 2019, at Tollesboro Funeral Home & Cremation Services in Tollesboro, Kentucky, with Brother Jack Airsmith officiating. Burial will follow in the Hillcrest Garden Cemetery in Lewis County, Kentucky. Friends may visit from 10:30 a.m. to 12 noon Wednesday, February 6, 2019, at Tollesboro Funeral Home & Cremation Services, 11918 KY 57, Tollesboro, Kentucky 41189. Danny McCoy, Troy Flora, Darren Spence, Brian Spence, T.J. Lykins, and James Schumacher will serve as pallbearers. "Email Address" would like to share the life celebration of Wilmer Ray Spence. Click on the "link" to go to share a favorite memory or leave a condolence message for the family.